There is a lot more to photography than simply picking up a camera, pointing it toward something, and tripping the shutter. Achieving a great photograph requires thought and preparation, an understanding of the photographic process, and a firm grasp of how light and composition affect a photo. There must be personal involvement and personal expression. There must be experimentation, with the recognition that only a small percentage of experiments end successfully. In this book, best-selling author and world-renowned photographer and teacher Bruce Barnbaum explores these seldom-discussed issues by drawing upon his personal experiences and observations from more than 40 years of photographing and teaching. In addition to photographs, Bruce also uses painting, music, and writing, as well as the sciences and even business, to provide pertinent examples of creative thinking. These examples serve as stepping-stones that will lead you to your own heightened ability to see and be creative. Creativity is a topic that is almost wholly ignored in formal education because most instructors think that it cannot be taught or learned. To the contrary, Bruce has proven that photographic seeing and creativity can be taught, learned, and improved. 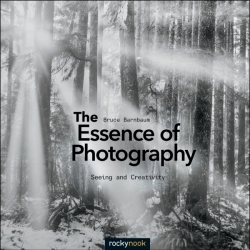 This book expands on the ideas that are central to Bruce’s method of teaching photography, which he has used in workshops for the past 41 years. The book is richly illustrated with over 90 photographs taken by Bruce as well as other photographers. Seeing and creativity are difficult to teach, but not impossible. This very different, perhaps groundbreaking book is sure to inspire photographers of all skill levels—from beginners to seasoned professionals—to think deeply about the issues involved in creating successful photographs.